The All-Purpose Smittybilt Combo Knife is the perfect knife to store in your Jeep for all purposes. The integrated windshield spike in the handle is great for any emergency and gives you a way to break glass to escape the vehicle. The Smittybilt Trail Axe is made from 402 stainless and has a unswept heat treated 4” x 7.5” Axe Blade for improved chopping efficiency. The handle is made from ergonomic nylon reinforced material so you can comfortably use the axe. Match sticks and a compass that is built into the end of the handle. The new Beaver Step from Smittybilt acts a stepping point to get to items from your rack and it can secure your tow strap when not in use. 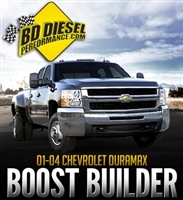 Get more performance out of your electronically controlled engine by plugging in one of BD’s Electronic Boost Builders. Installed in-line with the MAP sensor, the Electronic Boost Builder increases boost pressure and intercepts the message to the ECM, preventing it from setting an overboost trouble code that can cost between 50-80 horsepower. ● Eliminates over boost codes which can cause low boost pressure, dead pedal, engine derate and low horsepower. ● Uses factory sealed connectors. ● Compliments turbocharger and injector upgrades. ● Many aftermarket flash tuners do not have the boost fooling ability. 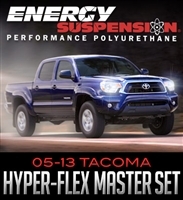 Energy Suspension has recently released their Hyper-Flex Master Set for the 2005-2013 Toyota Tacoma 2WD and 4WD. This kit includes everything needed to bring your trucks suspension back up to snuff while providing a long life performance replacement bushing. Hyper-Flex is Energy Suspension's unique and technically advanced chemical formulation performance polyurethane. Durability is superior to most rubber components that are used for cars, trucks and SUVs. Road salt, oil, and a host of other common under car contaminants will eventually destroy the rubber bushings on your vehicles, not to mention the weight and torque forces that typically compress most rubber permanently. Hyper-Flex replacement polyurethane components stand up well to contaminants that often destroy rubber and have been engineered to give longer-lasting performance and not compress permanently.